My name is Pamela Leggett, and I am the owner of Pamela’s Patterns, a pattern company based on teaching women how to create great fitting basic garments that flatter their “fluff and scallops”. 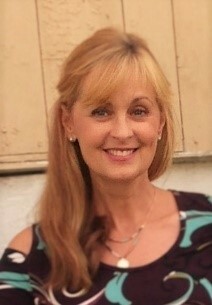 Check out www.pamelaspatterns.com for helpful YouTube tutorials, patterns and supplies. And if you need some help with your knit sewing techniques, get my Craftsy class, Fashion Sewing & Serging Techniques (order from my website and get 50% off!). A great fitting pattern, flattering angles, a bit of fringe and some cool stretch denim is all you’ll need to get this deconstructed look. While this technique could have been done on any skirt style, I chose the pencil skirt for its versatility. I wear this style skirt in the summer instead of shorts or capris (neither of which are flattering on me anymore! ), and it looks equally good in the fall/winter with tights and a pair of cool short boots. I used Pamela’s Patterns #109 Magic Pencil Skirt and a beautiful purple stretch denim from Fabric Mart. It isn't available anymore, but HERE are some other denims that would work well. 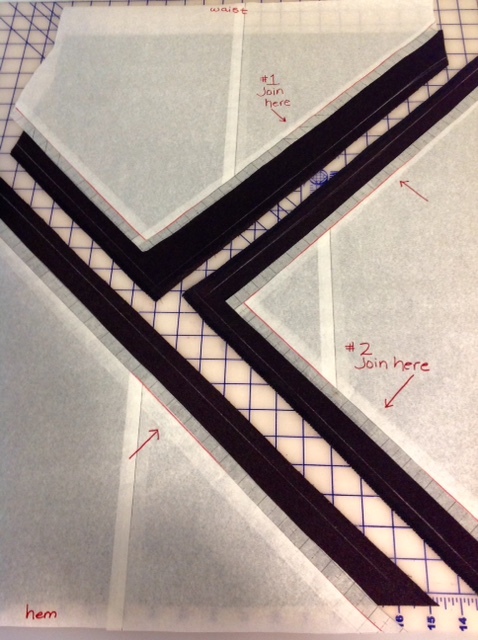 Trace two pattern pieces from your pattern, and tape them together at the center front to create a full front pattern piece. 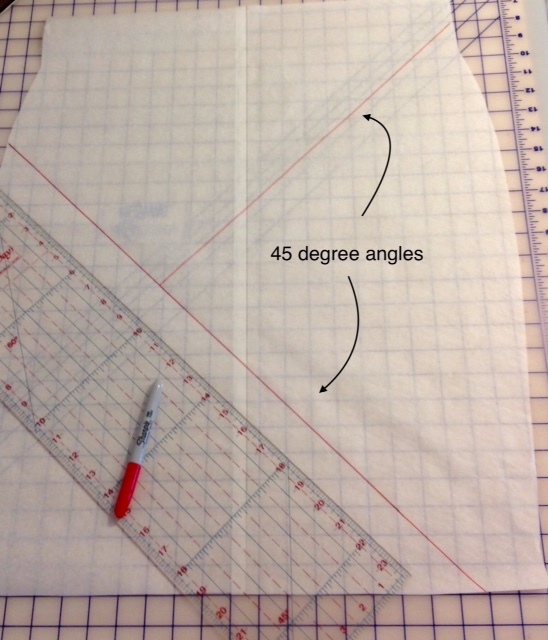 Use a quilting ruler to create 45-degree angle lines on the pattern. 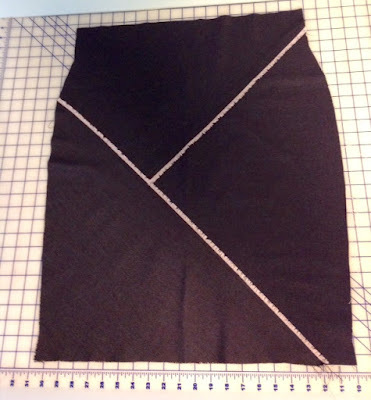 Think about where the lines are placed; I made my lines just above and below the widest part of my hips, a little off center, and extending into the hem. This placement is pretty flattering to most figures. 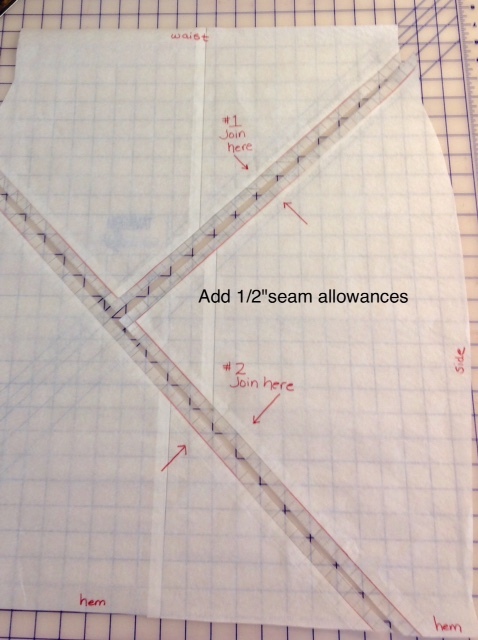 Cut the pattern apart on these lines, and add ½” seam allowances. I used Perfect Pattern Paper from Palmer/Pletsch to add the seam allowances, it has fraction lines printed right on it! The Magic Pencil Skirt Pattern features a smooth elastic waist finishing, so you will need a stretch denim if you are using this pattern. If you make this from a non-stretch denim, you will need to add a zipper. Denim is most often the combination of two colors of fiber – one color fiber in the crosswise grain, and another color in the lengthwise grain. You’ll want to test the fabric to see which “fringe” color you want to feature. 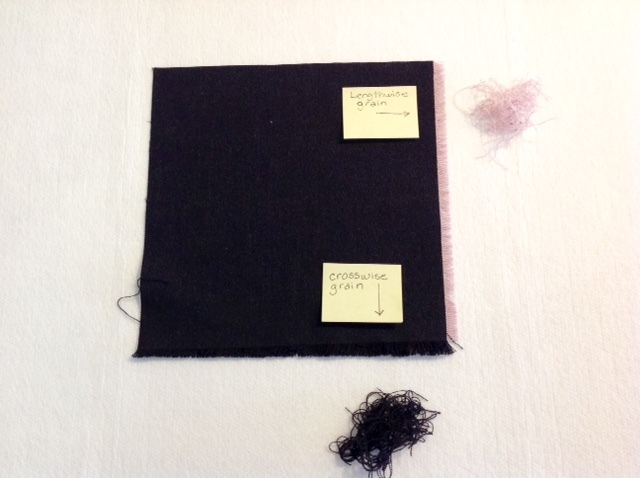 Cut a square of the denim and pull the fibers on each edge to create the fringe. Make a note as to which grain has the desired effect. Mark the pattern carefully to ensure that you know which grainline has the desired fringe look, and where the appropriate angle line of the pattern needs to be placed on the fabric grain. The angle line that will be fringed will be laid on the crosswise or lengthwise grain, making the side and waist/hem edges on the bias. Double check your layout, this is the part that needs concentration! TIP: Do this part before a glass of wine! Draw ½” lines with a chalk marker onto each of the pieces where the angles have been cut. You will be matching up these lines when putting it back together. Serge or zig zag finish the edges that will be underlapped. TIP: Lay the pieces out in the desired placement and finish the underlapped edges one at a time. It’s easy to get confused! Overlap the first section on the ½” lines. 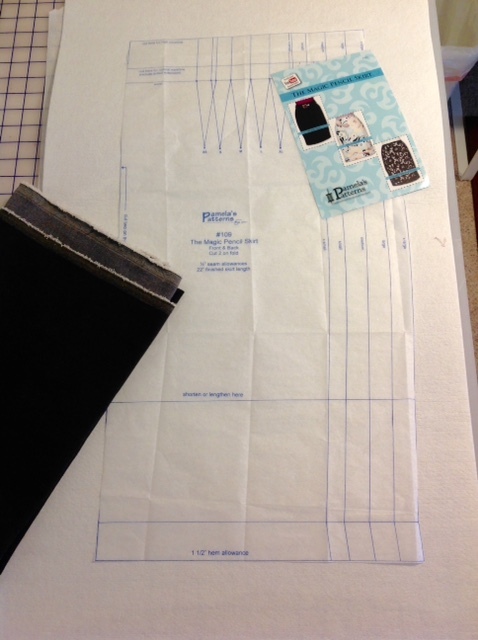 I found a very easy way to do this is to use Double Sided Fusible Stay Tape. Cut the stay tape to a 3/8” width and fuse to the right side of the underlap edge. 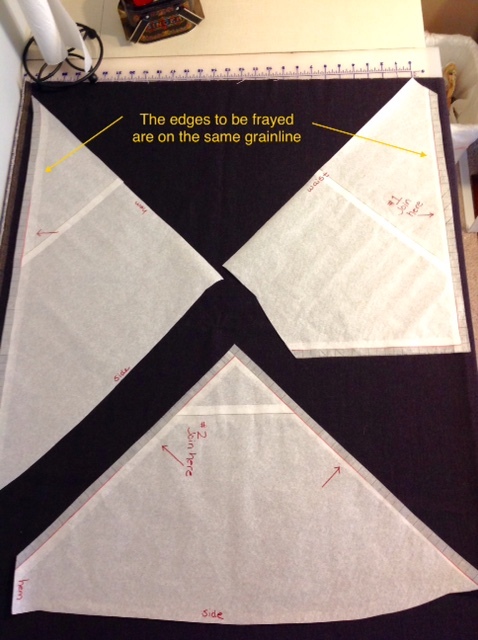 Peel off the release paper, match up the ½” lines and press in place – no pinning needed! Straight stitch two rows of stitching, about ¼” apart, just above and just below the marked line on the fabric. I have a coverstitch machine, and used that to get both rows done at the same time – and I love the way it looks on the wrong side of the fabric! Fringe the edge up to the first row of stitching. 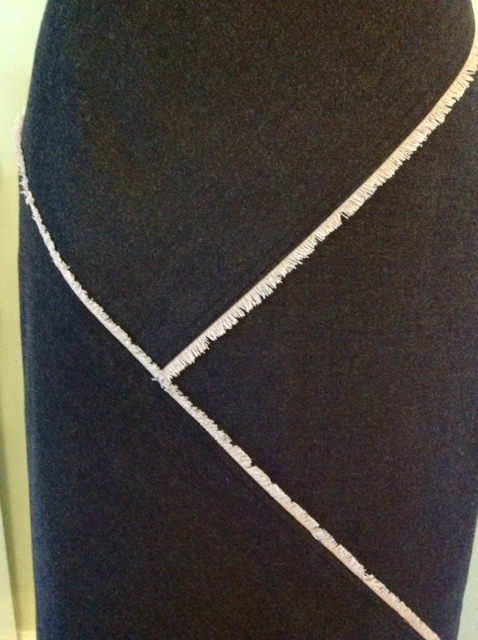 Repeat for the final skirt section. Now cut out the back of the skirt and construct per the pattern instructions. 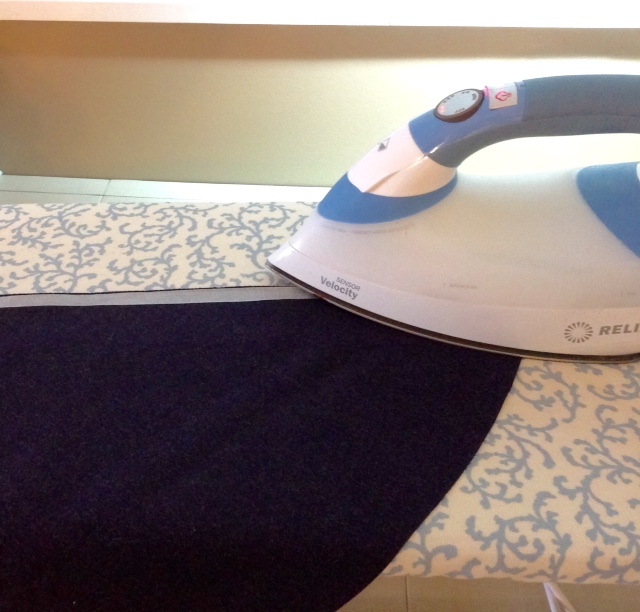 This skirt takes less than an hour to make! - I felt like my fringe look too “uniformed”, so I snipped into the fringe and at angle every ½” or so. Then I roughed it up a bit with my hands. It is a subtle difference, but I liked it better! - Be sure to check out my website for all the supplies mentioned in this lesson – Pattern Paper, Stay Tape and Fantastic Elastic to finish the waist. Thanks, it was fun to make! I am speechless! Thanks for the tip on creating this look. It is beautifully made. I will definitely try this technique on my next pencil skirt, in denim too! I love the blouse that you have paired it with. Did you make the blouse too? What pattern and fabric is that? It is so funny that you asked about the blouse - my daughter asked the same thing! I got the blouse on the sale rack at Soft Surroundings last year. When I buy clothes, that is my go-to store! Love it! Great twist on the basic pencil skirt. Pamela, I love it my friend....I will try it for sure. That's brilliant! I love it! I want to make this skirt now.